Choosing flooring for your conservatory can be a challenging task, but making the right choice for your room is important. Today conservatory floor coverings come in many shapes, styles, designs and colours; from ceramic, porcelain, terracotta and quarry tiles, granite, sandstone, marble, slate, cork, flotex, laminate, carpet, bamboo, engineered and hard wood flooring. Depending on how much time you are going to spend using the conservatory and the overall look that you are trying to achieve, there is a finish of flooring to suit every style and budget. – What will the conservatory be used for? – How much time you will spend in there? – Does it need a specific floor covering to cater for your work or hobby? – Will the conservatory be used all year round? – What heating will the conservatory need? – Which direction does the room face? – What flooring can you afford within the budget set? 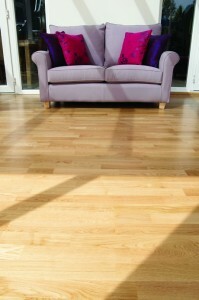 A conservatory can look luxurious with your choice of flooring and enhance the look of the room. The choice from soft and tactile carpeting to firm, natural and hard wearing flooring must suit your needs. If you are letting your pets in from the garden or entering the conservatory with muddy boots after gardening then perhaps carpet might not be the right choice. We humans know to wipe our feet on the door mat, but I am not so sure our pets will do! Natural flooring such as a stone or tile finish is very hard wearing, but cold to the touch. Are you a night owl, up and about when the rest of the household is in bed and the main heating has gone off? If so, you might like something warm underfoot and choose to install under floor heating. Underfloor heating is a clean way of heating your conservatory all year round, with no visible radiators or fires/wood burners to make or gather dust. The heat emitted from an underfloor heating system is distributed more evenly than a radiator, making it an efficient way of heating a room. There are two main types of underfloor heating; they are an electric (dry) system and a water (wet) system. Both the systems are associated with a hard floor, but can be fitted under carpet providing it is not too thick. There are pros and cons for each system, so do some research and ensure that the system you have installed suits your homes needs. Once a hard floor is warm it acts like a large radiator, heating the room from the bottom up and keeping your feet and body warm. I quite like the idea of having underfloor heating with either a hardwood or tiled floor for the summer months and then for the winter, when you need to feel a little more cosy in the conservatory adding a rug. It will make the room feel warmer and by choosing a different colour or patterned rug will change the mood of the room according to the seasons from a summer to winter took. 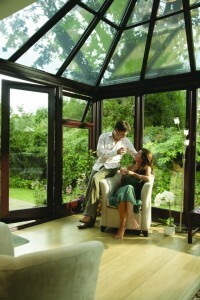 A conservatory is a very special place to relax and enjoy the views from your home. Whether you are laying on your back and looking at the sky through the double glazing or laying on your tummy reading a book on the floor, we are sure that it will be a lovely view either way!